We visited 7 different places in China over a period of 17 days. It would have been a wasted opportunity, in my opinion, to travel so far, and stay in one place. However, there was A LOT of travelling! We underestimated just how much travelling actually. 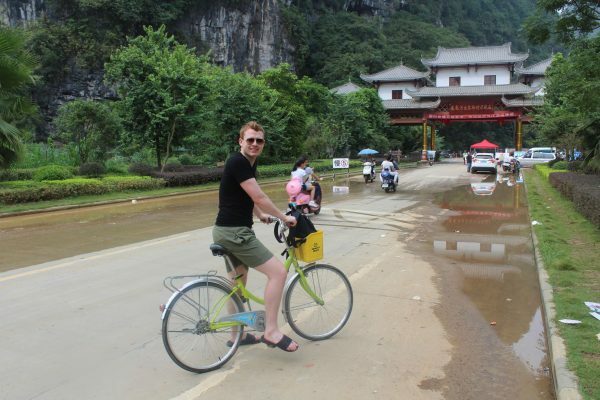 Planes, trains, overnight trains, buses, cars, bikes, bamboo rafts, walking, every mode of transport you could think of, we covered it during our trip. 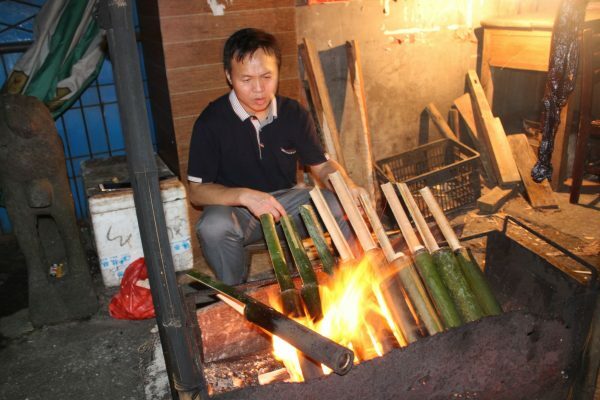 But, there is no other way to experience China, in my opinion. If you’re interested in how we planned our trip, including prices and booking, I’ve written about that separately here. 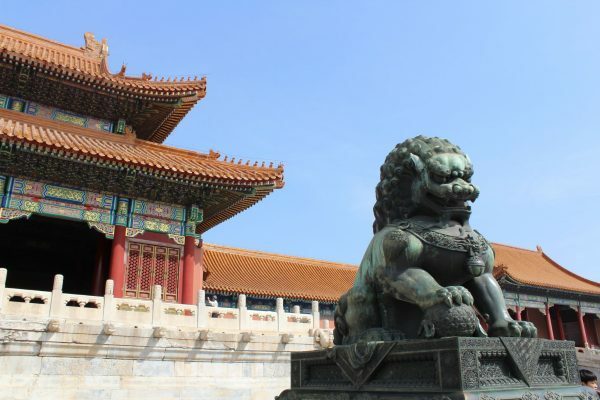 Before we left on our adventure, I thought Beijing would be my favourite part of the tour, but it actually turned out to be my least favourite part! That doesn’t mean I didn’t enjoy myself; I had a ball! 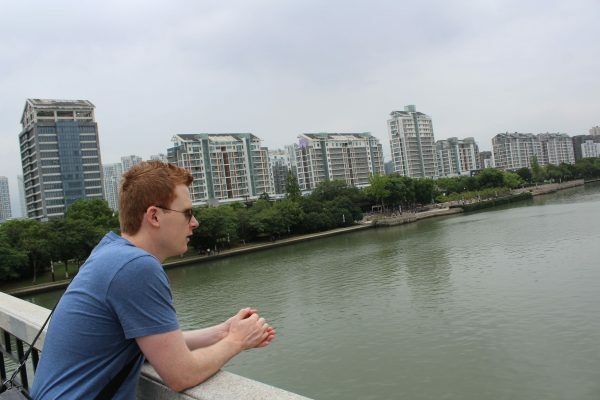 It’s just that Beijing, the city itself, was nothing like I imagined. It was grey, dull and not very built up at all! We later found out that the government restrict the height of the buildings so that nothing is taller than The Forbidden City. 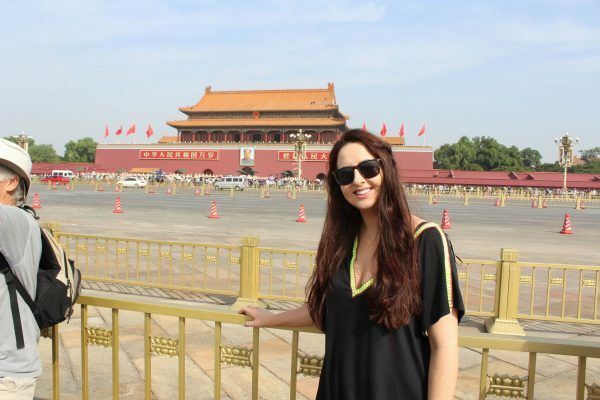 We visited The Forbidden City and Tiananmen Square, along with 80,000 other people! It was manic and not worth the trip in my opinion. Beijing may have been my least favourite place but my favourite part of the tour was definitely hiking up the Great Wall of China! 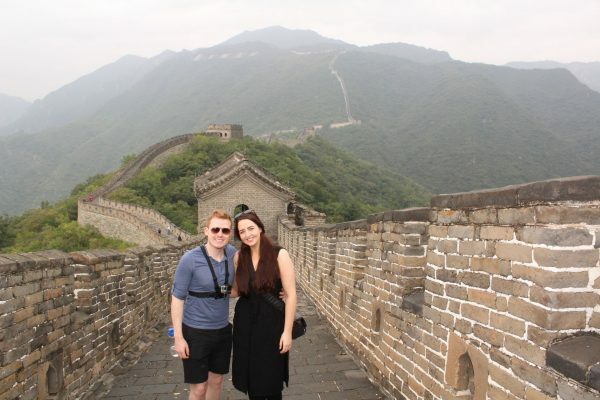 The Great Wall of China was on the top of my bucket list for as long as I can remember and it was everything I imagined. The Top of The Great Wall. Did you know it was so steep? 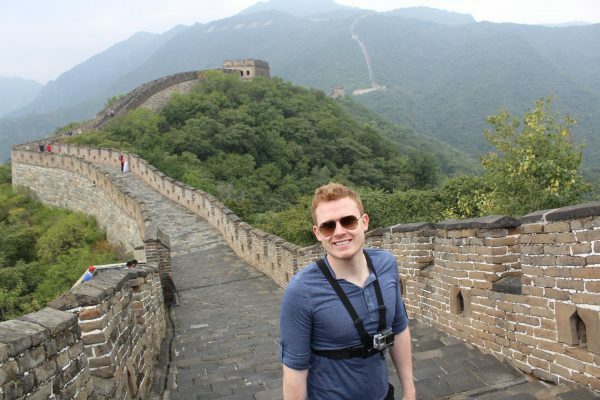 In particular, tobogganing down The Great Wall of China was on the top of my bucket list ever since I watched Beyoncé do it. Watch my video below! 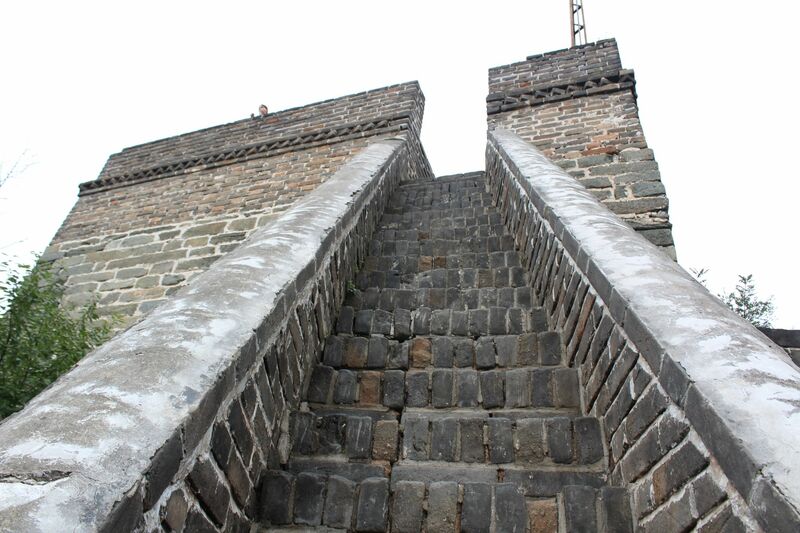 Travel Tip: If you are not interested in The Great Wall of China (but why? 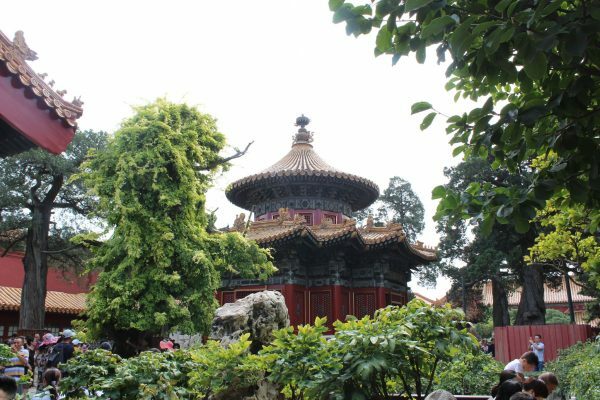 ), I would recommend that you skip Beijing altogether. There are other amazing places in China worth visiting, like Chengdu, home to 80% of the pandas left in the world (I need to visit here). 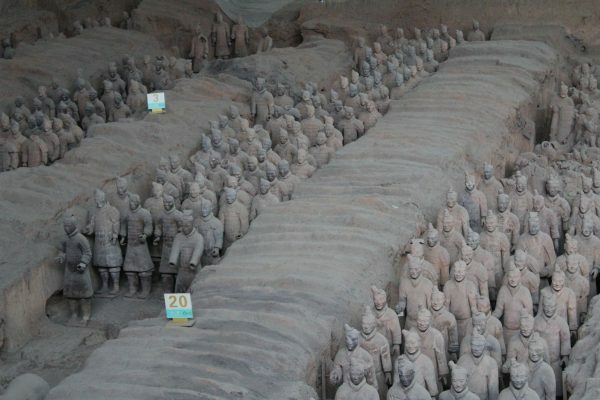 We travelled to Xi’an on the bullet train, where visited one of the world’s greatest archaeological treasures, The Terracotta Warriors. I loved this tour, it was fascinating! You can read more about it and see lots of pictures here. 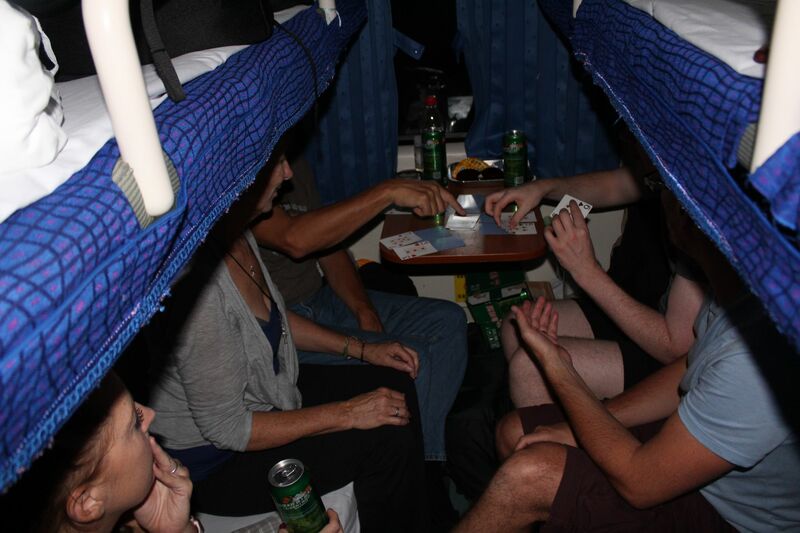 We travelled from Xi’an to Suzhou on an overnight train, for 14 hours, which I can’t stop laughing about. We had a ball on this train with our new pals! Loads of goodies, loads of cans and a few card games, kept us entertained before bedtime. When we woke up, we had arrived at our destination. 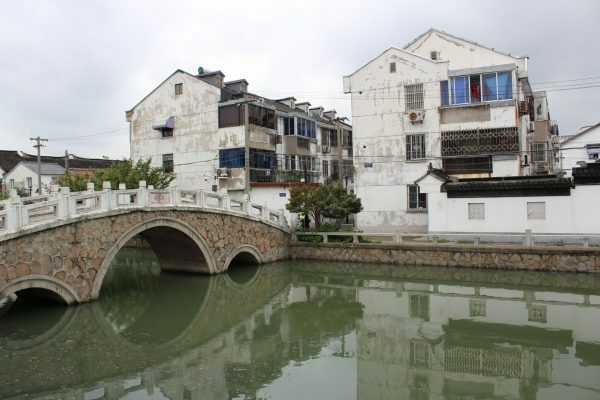 Suzhou is known as the “Venice of the East” which I was so excited about! I’ve always wanted to go to Venice and Darren booked us a weekend there for our first wedding anniversary at the end of October! Anyway, it was absolutely nothing like Venice. There were gondola rides but we were advised not to do them because the locals hit the passing boats with mops, because they don’t want the traffic going by their house! Suzhou reminded me of Amsterdam which I love! I visited Amsterdam in May and wrote about my trip here. We only stayed in Suzhou for 1 night. It was more like a lay over to break up the travelling. While we were there we did manage to squeeze in a trip to a Silk Factory; that was so cool! They gave us a tour of the factory and talked us through the entire process of making silk. 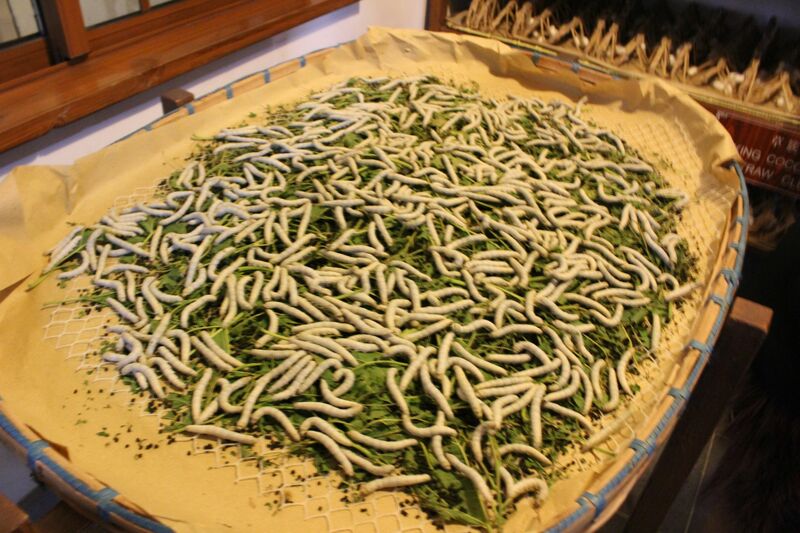 We were even introduced to the silk worms! I loved Shanghai. It reminded me of New York, which is my favourite city in the world, so that’s no surprise! You can read my top tips for visiting New York here. We didn’t have long in Shanghai, 2 days, but I really enjoyed it. 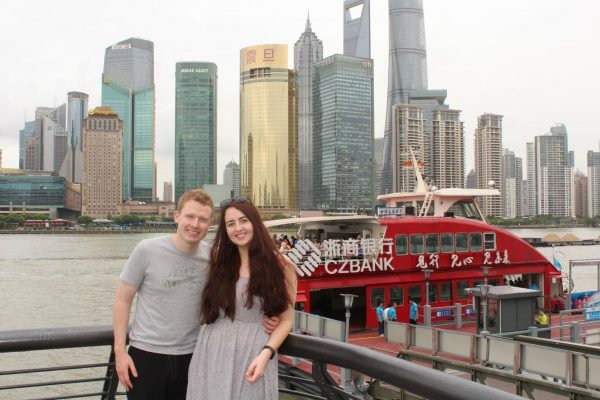 On the first day, we walked around The Bund (a waterfront that offers amazing views of the city). We went to a Chinese acrobat show that evening and it was one of the best shows I’ve ever seen. The production was unbelievable, they even had a live band and a singer! 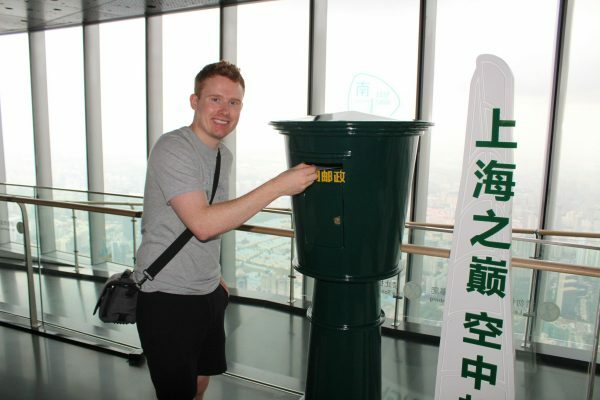 We visited the Shanghai Tower, the second tallest building in the world, and home to the highest post office in the world! We obviously sent off a couple of postcards while we were up there. 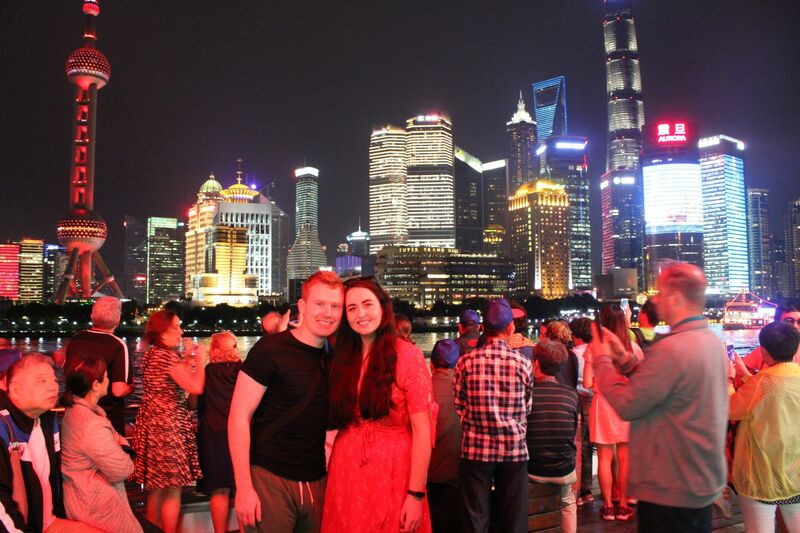 The Shanghai Light Show was unreal! In fact, this was the highlight of the tour for my husband Darren and definitely one of my favourite moments. A boat took us up the river and around the city to witness these amazing views. I said it’s like New York, but it is definitely prettier than New York (I’m sorry New York, I love you!). After 2 nights in Shanghai, we said goodbye to our pals, because most of the group departed from the tour here. We met some really awesome, like-minded people who were just as adventurous as myself and Darren. We travelled from Shanghai to Longji on our second overnight train, for 19 hours, and it definitely wasn’t as fun as the first! It was horrendous but it’s all about the experience (the good and the bad!). I’ve written more about the overnight trains here. 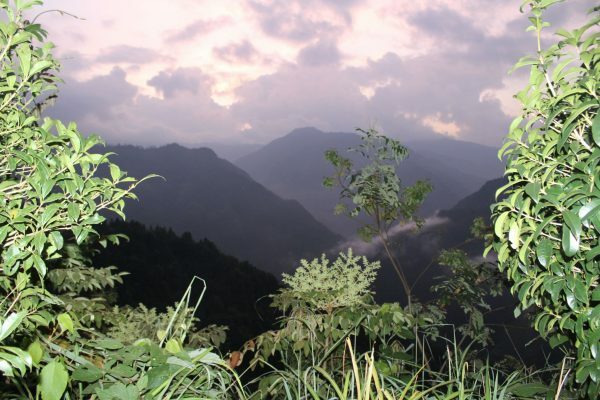 I have to be honest, I never heard of Longji before, and some of the other places we visited on our trip. So when we received the itinerary, I Googled everything. 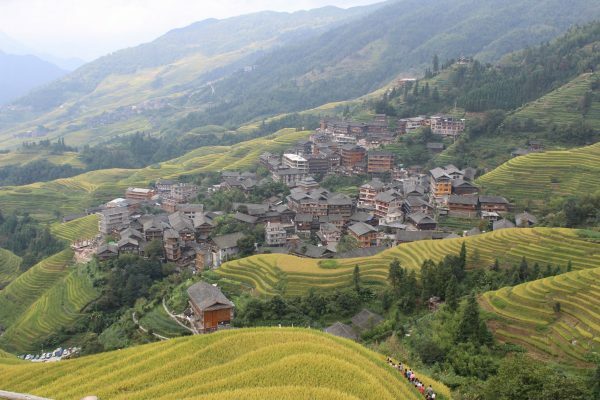 When I seen what Longji looked like, my jaw actually dropped. You know when you see some places online though and then they are disappointing in real life? Well, let me assure you that pictures do not do Longji any justice! It is much more beautiful in real life. This is the village where we stayed. It was literally up a mountain so the bus could only take us so far. 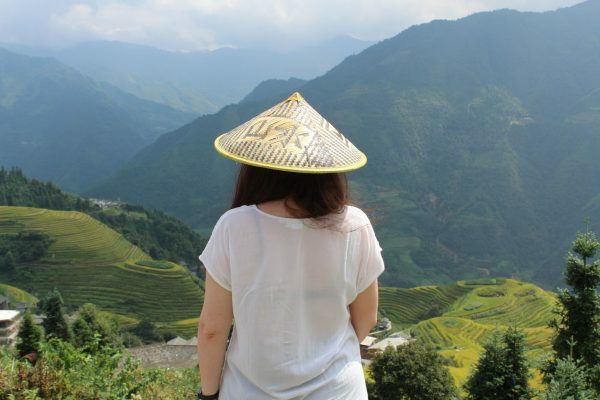 We spent a half of day trekking along the rice terraces in Longji which means “Dragon-backed Mountain”. This is because when the rice paddies are filled with water in the spring, they look like scales on a dragon. I loved this, even though I didn’t think I would be a fan of the trekking! It wasn’t hard, although it probably was and I was just so distracted by the beautiful scenery. When we reached our destination, we celebrated with an ice cold beer, living up to our Irish stereotype in style! I have to be honest, staying in Longji was like going back in time! There was no traffic, some people were barefoot, the village blacked out regularly; it was such a simple way of life! Although it was such a nice, refreshing part of the trip. We travelled from Longji to Yangshuo on a bus. 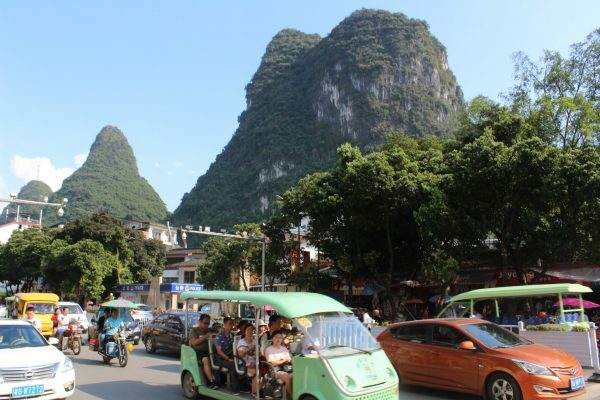 Yangshou was my favourite place that we visited! Supposedly, it’s where the Chinese people go on holiday. It’s like the Chinese countryside and there is so much to do! We rented bikes and cycled for hours. It didn’t feel like it though, it was so enjoyable and the scenery was breathtaking. 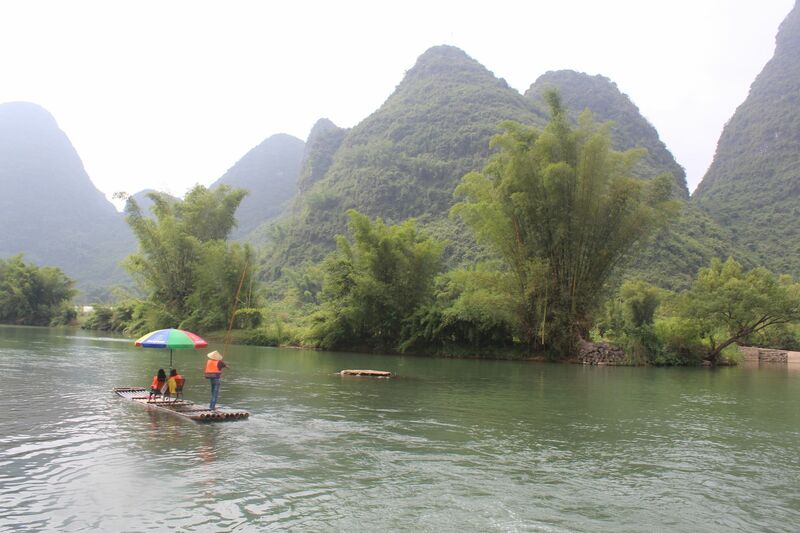 At one stage, we parked the bikes and went on a bamboo raft! Such a relaxing experience. 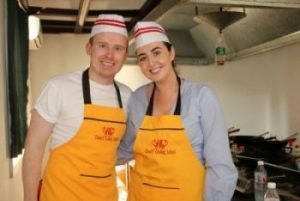 My favourite thing that we did in Yangshou was the Chinese Cooking Class! You can get all of the details and the scrumptious recipes in this post here. 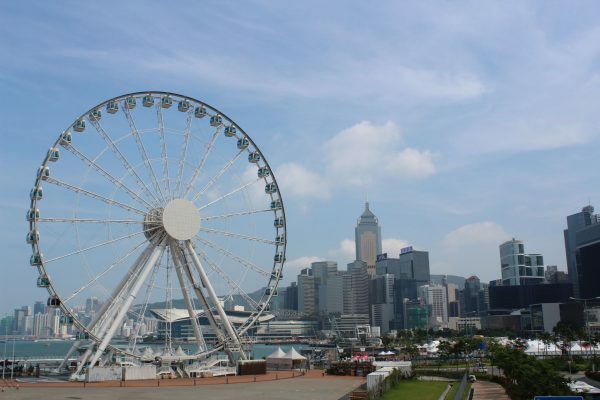 Hong Kong is what they call “westernised” meaning it has a similar culture to what we’re used to. It’s completely different to mainland China. It even has it’s own laws and currency (the Hong Kong Dollar). The food options were more or less the same as they are in Ireland and they used knives and forks! The toilets were the same (HALLELUJAH! ), the plug sockets were the same and more people spoke English. I felt Hong Kong was like Miami and New York combined. 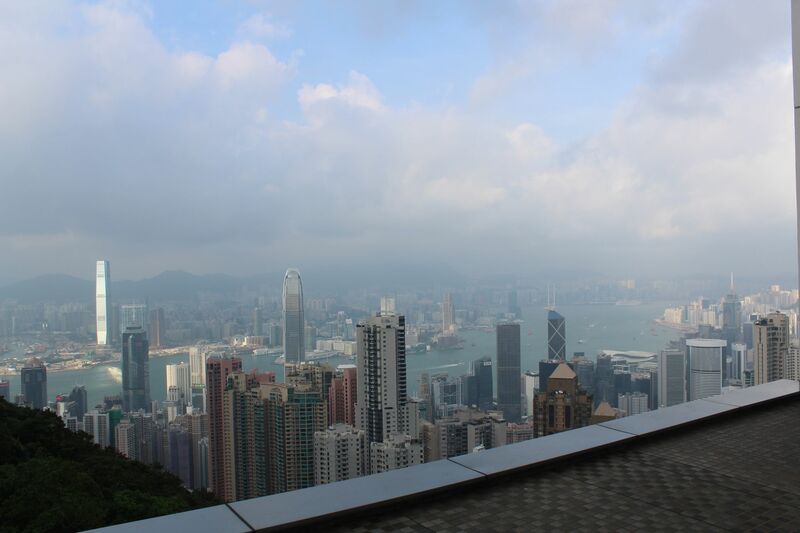 We went to Hong Kong Island and took the tram to the peak of the city. The views were unbelievable and there was a Bubba Gump Shrimp restaurant there too! After 3 weeks of Chinese food, I was never so happy to see a chip in all of my life! I’m not sure whether many people know this, but there’s a Disneyland in Hong Kong. Since I’m a real-life princess, I’d usually jump at the opportunity of going to Disneyland. However, we visited Disneyland, Orlando as part our honeymoon last year so I wasn’t really pushed on visiting. It’s really easy to get to from the city though. You can get the metro or it’s about €15 in a a taxi. 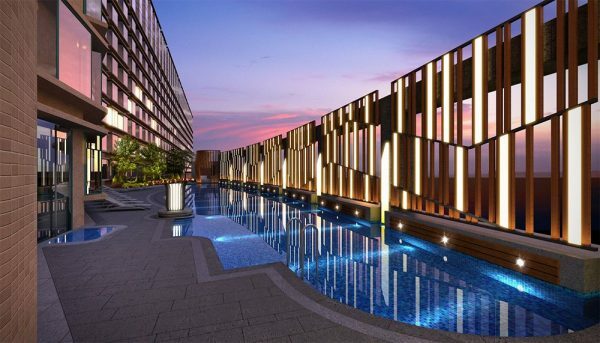 There was an outdoor pool, jacuzzi, sauna and steam room. We weren’t allowed the camera at the pool but I found this picture online. Travel Tip: If you’re travelling to somewhere new, research what other places are in the vicinity of your location. When we visit anywhere, we always research (Google) to see what other places are around. So, we discovered that Macau, the Vegas of the East, is only a short ferry ride away from Hong Kong. We didn’t get to visit though since the ferry was booked out (we should have organised it when we first arrived in Hong Kong). Would I Recommend a Trip to China? Yes!!! We had the time of our lives but I can see why it wouldn’t be for everyone. There is a massive difference in culture, language barrier and if you’re doing a trip like ours, a lot of travelling! However, if you are adventurous, open minded, and prepare yourself for it physically and mentally, I’ve no doubt in my mind you would have the most amazing experience! 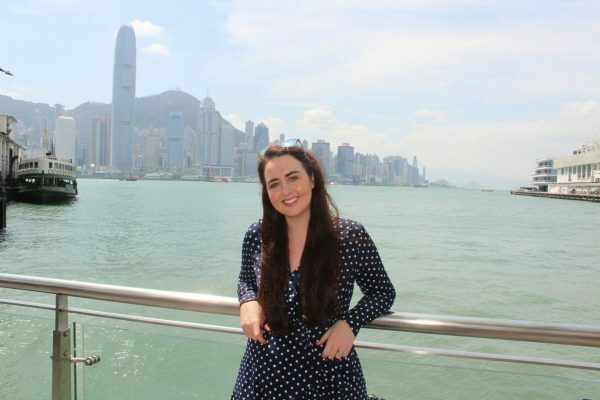 I’ve put together a blog post on 9 Things You Need to Know Before Travelling to China; it’s a must read, even if you’re only contemplating it at the minute! Pictures can only tell so much of a story, to see what China was really like, watch my travel vlog below. We have seen a lot of the world this year and we don’t plan on slowing down any time soon! You can follow me on Facebook, Instagram and Snapchat (livelavishlycom).